Ecomom was a small startup internet retail company selling earth friendly mom and maternity products including food, toys, apparel, and other baby related items. With headquarters in Las Vegas and San Francisco and a third-party fulfillment in Los Angeles, any volume could be shipped within 24 hours. Founded in 2007, by 2011 it had turnover of just over $1 million, but a further round of investment of $12 million required further growth, but at what cost? Business Insider describes the story of the eventual failure of the company in 2013 With hindsight it's difficult to understand investment in the company, but perhaps this was buoyed by the success story of Tony Hsieh building Las Vegas-based Zappos into an online shoe and retail business that Amazon acquired for $1.2 billion. Of course, investors, require growth and Ecomum did achieve revenues of nearly $4 million in 2013. But investors also require a return on their investment and as you’ll read, the way growth was achieved was far from profitable. In this open letter describing the failure of the company Prentiss shows how the financial presentation format hid a contribution margin of –48% which he identified when he joined the company. In other words, for every additional $60 average order shipped the variable cost was $89 and the company lost $29. This situation was caused by heavy discounting with common use of 50% discounts on daily deal sites like Groupon. To make matters worse, although discounts were meant to be one time only, the company couldn’t limit them by customer, so every discounted order has a 50% reduction regardless whether they were from a new company or an existing company. The company sales manager was paid based on sales achieved before discounting. As the same time, there were no premium lines or own-label items where margin could have been better. Add to this, that this is a fiercely competitive growing sector with established retail brands such as Whole Foods or general retailers such as Amazon selling similar goods. By mid Autumn 2012 a $860K loss for the previous quarter was the result of the discounting strategy. Prentiss notes that no substantive changes were made to the business strategy and starting from $4.8 million capital raised in Aug for the 5 monthsthrough Dec 31st the company lost $1.1 million after variable cost, spent $1.7 million more on overhead, and locked up another $1.2 million in inventory leaving less than $1 million in the bank. Sadly, the company closed early in 2013 and shortly afterwards, the CEO, Jody Sherman took his own life. 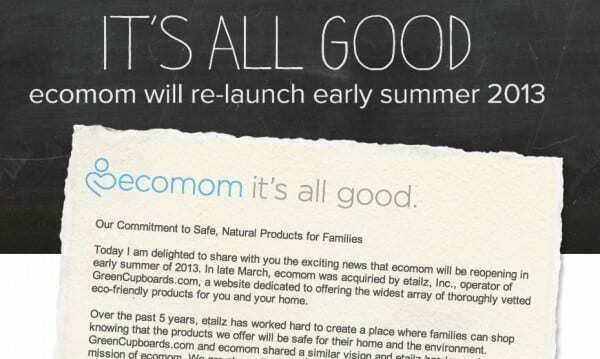 In the unsentimental way of business, Ecomom’s domain and customer list was purchased by a competitor and the website was planned for reopening later in 2013 with this more than unfortunate message.